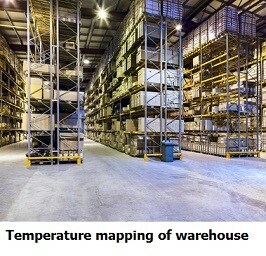 Complete temperature mapping and validation services required for Healthcare, HACCP etc.for assets such as cold rooms, vans, reefer trucks, ware houses, refrigerators etc. especially used for transportation or storage of temperature sensitive goods such as medicines, vaccines, food etc. The purpose of this temperature distribution study is to analyze whether the temperature inside the asset is always maintained within the permitted levels. Temperature distribution study is carried out in different climatic seasons to analyze the effects in different climates. 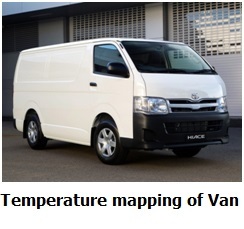 Temperature mapping study is also known as temperature distribution study. If humidity distribution also need to be analyzed, the study is termed as Temperature & Distribution mapping study. Temperature mapping for critical Data center / server panels. This is also known as thermal mapping and is carried out to analyze the temperature distribution inside a server panel or other critical racks normally installed in data centers. Hot and cold points inside the panel will be identified by this study and temperature sensors can be installed for continuous monitoring and alert systems at these points. Infrared (IR) Thermal Imaging of Panels , Machinery, Transformer etc. IR Thermal imaging will be carried out to identify potential problems of critical equipment. This is carried out using thermography using infrared thermal camera. We undertake this as a complete study and provide report on any existing or potential problems of the installation. 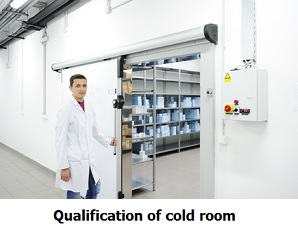 Temperature qualification is a detailed study carried out for walk in freezer, cold room, warehouse, van, reefer, refrigerator, freezer etc. to certify that the asset is completely capable of maintaining the required temperature. The process involves checking and verification of various equipment installed and carrying out a temperature & humidity mapping study. Various verification such as design qualification, installation qualification, operational qualification etc. will be carried out .